G.Skill has announced a new "extreme performance" DDR4 memory kit at DDR4-4600MHz CL19. Its new DDR4-4600MHz Trident Z memory kit is designed for dual-channel operation on the Intel X299 HEDT platform. The memory kits are built with hand-selected, high-quality Samsung B-die IC components, and will be made available in an attractive silver or black aluminium heatspreader finishes (no RGB LEDs here). Pictured above and below you can see the choice of two sleek designs and colour schemes G.Skill supplies its new Trident Z memory kits in. Buyers can choose between a silver aluminium body with white accent bar, shown above, or black aluminium body with black accent bar. These particular kits might be available in a choice of two colour finishes but there is only one kit size available, at least initially. G.Skill's sole Trident Z Series DDR4-4600MHz kit offers a total capacity of 16GB (8GBx2), probably a decent amount of RAM for many PC enthusiasts at this time, weighing up price vs performance benefits. 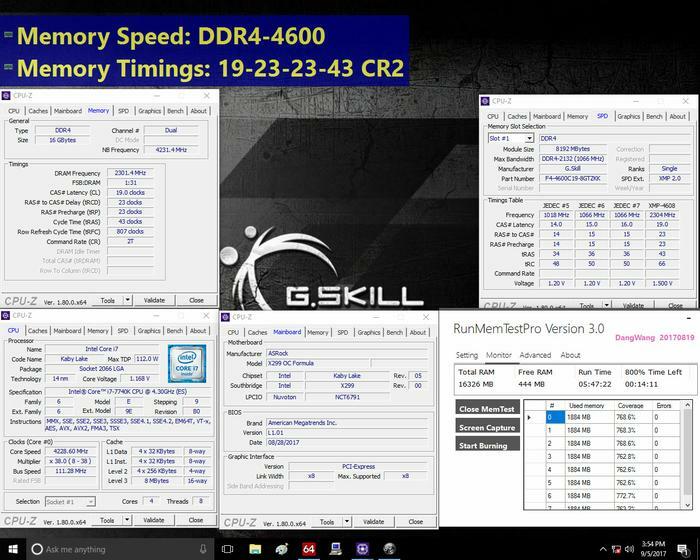 G.Skill notes that previously DDR4-4600MHz "was only achievable under extreme overclocking with liquid nitrogen cooling". Thus it is rather pleased with its XMP 2.0 compatible new Trident Z memory kit which is certified to run at DDR4-4600MHz CL19-23-23-43 at 1.5V. A screenshot below shows the memory kit in action, validated with an Intel Kaby Lake-X Core i7-7740X processor installed on the new ASRock X299 OC Formula motherboard. We haven't been supplied with pricing details for the Trident Z Series DDR4-4600MHz 16GB memory kit, even the product page is yet to go live. G.Skill says kits will be available to purchase via the usual partner distributors at the end of this month. is it really necessary to have +3500mhz memory? who needs such high speed RAM? It's not necessary it's e-peen. Or going for overclocking records. In any case 3200 ish is the sweet spot I think. It's not E-Peen, if you have the money and want performance go for it, I think 3200mhz-3866mhz is the sweetspot for price-performance however pricing for RAM is stupid atm.